Cancer of the uterine corpus is the most common pelvic gynecologic malignancy in the United States and in most developed countries with access to sufficient health care. Approximately 95% of these malignancies are carcinomas of the endometrium. The most common symptom in 90% of women is postmenopausal (PMP) bleeding. Most women recognize the need for prompt evaluation, although only 10-20% of women with postmenopausal vaginal bleeding have a gynecologic malignancy. Because of this prompt evaluation, 70-75% of women are diagnosed with surgical stage I disease. Currently, no screening tests for cancer of the uterus are recommended for asymptomatic women. No evidence suggests that routine endometrial sampling or transvaginal sonography to evaluate the endometrial stripe in asymptomatic women has a role in early detection of uterine cancer, even in women who take tamoxifen after breast cancer or has a cancer syndrome. The early detection, presenting symptoms, and higher survival rate make it unlikely that screening will have a successful impact on improving survival rates. Approximately eighty percent of endometrial carcinomas are endometrioid adenocarcinomas. Other histologic subtypes include adenosquamous, clear cell, and papillary serous carcinomas. Sarcomas make up about <9% of uterine corpus malignancies, including carcinosarcomas or mixed homologous müllerian tumors, 48-50%; leiomyosarcomas (LMSs), 38-40%; and endometrial stromal sarcomas (EESs), 8-10%. The remaining sarcomas are made up of heterologous tumors—tumors that contain histologic components foreign to the uterus, such as rhabdomyosarcomas, osteosarcomas, and chondrosarcomas. This article discusses endometrial cancer and uterine sarcomas. See the image below. Adenocarcinoma of the endometrium. This tumor, which occupies a small uterine cavity, grows primarily as a firm polypoid mass. Courtesy of TELEPATH, Armed Forces Institute of Pathology (AFIP). Incidence of endometrial cancer is higher among Caucasians compared with Asian or black women; however, mortality is higher among blacks. This is thought to be due to poor access to care and presentation at more advanced stages. Endometrioid adenocarcinoma can be due to excess estrogen from various sources, either exogenous or endogenous. Exogenous sources have included unopposed estrogen replacement therapy or tamoxifen use. Tamoxifen increases endometrial cancer risk by its agonist activity on the estrogen receptors on the endometrial lining. Endogenous estrogen sources include obesity and polycystic ovary syndrome (PCOS) with anovulatory cycles, or estrogen-secreting tumors such as granulose cell tumors. Increasing body mass index has been associated with increasing risk of endometrial cancer. Research has found a relative risk of 3 in women 21-50 lb overweight and relative risk over 10 in women more than 50 lb overweight. Androstenedione is converted to estrone, and androgens are aromatized to estradiol in the adipose tissue, leading to higher levels of unopposed estrogen in obese women. See Table 1. The other factors associated with increasing one’s risk of endometrial cancer are believed to be related to the same mechanism of increased levels of unopposed estrogen. Nulliparity and infertility are likely related to chronic anovulation. Increased alcohol use can elevate estrogen levels. Late menopause and early menarche can be associated with more anovulatory cycles and thus more unopposed estrogen. While there is no evidence that screening for endometrial cancer in high-risk populations, such as patients on tamoxifen or patients who have HNPCC syndrome, decreases mortality, some societies advocate screening with endometrial biopsies starting at age 35 years in patients with HNPCC. Factors that decrease unopposed estrogen are associated with decreased risk of endometrial cancers. The use of combination oral contraceptive pills for 12 months decreases the risk of endometrial cancer by more than 40%. Similarly, postmenopausal women taking the combined estrogen and progesterone hormone replacement therapy have also been found to decrease their rate of endometrial cancer. Smoking is thought to decrease the risk of endometrial cancer by decreasing estrogen levels as well as leading to earlier menopause. The following have been identified as risk factors for the various uterine sarcomas. Risk factors for uterine leiomyosarcomas may include early menarche, late menopause, and African American race. Women with a history of pelvic radiation are at greatest risk for carcinosarcomas and leiomyosarcomas. Nulliparous women may be at greater risk for both types of sarcomas. Tamoxifen use also increases the risk of endometrial carcinoma as well as uterine sarcomas. Endometrial cancers are divided into 2 classes, each with differing pathophysiology and prognosis. More than 80% of endometrial carcinomas are type I and are due to unopposed estrogen stimulation, resulting in a low-grade histology. It is often found in association with atypical endometrial hyperplasia, which is thought to be a precursor lesion. Type II endometrial cancers are thought to be estrogen independent, occurring in older women, with high-grade histologies such as uterine papillary serous or clear cell. Direct/local spread accounts for most local extension beyond the uterus. Lymphatic spread accounts for spread to pelvic, para-aortic, and, rarely, inguinal lymph nodes. Hematologic spread is responsible for metastases to the lungs, liver, bone, and brain (rare). Peritoneal/transtubal spread results in intraperitoneal implants, particularly with uterine papillary serous carcinoma (UPSC), similar to the pattern observed in ovarian cancer. Endometrioid adenocarcinoma of the endometrium, the most common histology, is usually preceded by adenomatous hyperplasia with atypia. If left untreated, simple and complex endometrial hyperplasia with atypia progress to adenocarcinoma in 8% and 29% of cases, respectively. Without atypia, simple and complex hyperplasia progress to cancer in only 1% and 3% of cases, respectively. See the image below. Typical histologic pattern, specifically cribriform glandular appearance, of endometrioid adenocarcinoma of the endometrium. Increased nuclear atypia and mitotic figures are present. Less histologic differentiation is associated with a higher incidence of deep myometrial invasion and lymph node metastases. Subsequently, the depth of myometrial invasion and presence of tumor in the lymph nodes is directly related to recurrence rates and 5-year survival rates. The most common histologic subtype of endometrial cancer is endometrioid adenocarcinoma, accounting for about 75-80% of endometrial cancers. Less common histologies include adenosquamous (2%) and mucinous (2%). When corrected for grade, however, the presence of squamous components has not been demonstrated to cause a significant difference in prognosis compared to pure adenocarcinomas. PTEN mutation is thought to be an early event in low-grade endometrial cancers and is found in 55% of hyperplasia and 85% of cancers, whereas it is not found in benign endometrium. Approximately 15-20% of endometrial cancers are type II cancers with papillary serous or clear cell histologies. Papillary serous histology represents 5-10% and clear cell histology represents less than 5% of endometrial cancers. They are considered high grade with poor prognosis. They have a propensity for early nodal or upper abdominal spread even with minimal or no myometrial invasion. The p53 mutation is more common in high-grade tumors, and ERBB-2 (HER-2/neu) mutation is common in type II cancers. Even with surgical stage I cancer, the 5-year survival rate is 60%. Histologically, uterine papillary serous carcinoma (UPSC) resembles papillary serous carcinoma of the ovary. Although adjuvant chemotherapy is helpful, UPSC does not have the same duration of response to cytotoxic agents (eg, paclitaxel, carboplatin) as its ovarian counterpart. Carcinosarcomas or malignant mixed müllerian tumors (MMMT) are typically comprised of a high grade epithelial carcinoma and stromal sarcoma. The sarcomatous portion of the tumor may exhibit an endometrial stromal sarcoma (ESS) pattern, if differentiated. The MMMT is considered homologous if the sarcomatous tissue types are native to the uterus. MMMTs are termed heterologous only if identifiable extrauterine histology is demonstrated, such as rhabdomyosarcoma, chondrosarcoma, osteosarcoma, or liposarcoma. MMTs are characterized by early extrauterine spread and lymph node metastases. Extrauterine disease and lymph node metastases are directly related to depth of myometrial invasion and the presence of cervical disease. The presence of heterologous elements does not seem to affect prognosis in terms of the initial extent of disease. New evidence points to a substantial expression of c-kit receptors in MMMTs. 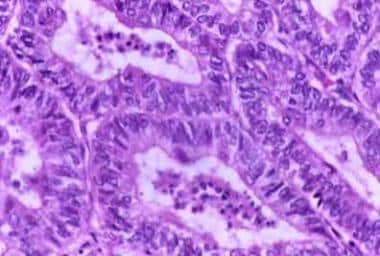 The histopathologic diagnosis of uterine sarcomas can be unclear until the time of definitive surgery. Diagnosis of leiomyosarcoma is dependent on the number of mitoses and the degree of cellular atypia. The diagnosis of leiomyosarcoma versus leiomyoma and leiomyoma with high mitotic activity or uncertain malignant potential is based on the metastatic potential of the tumor. The mitotic count and cellular atypia correlates to this metastatic potential. Although controversy continues to exist regarding the diagnosis of leiomyosarcoma, several studies support the theory that if the mitotic count is less than 5 per 10 high-powered fields (HPF), the tumor is a leiomyoma with negligible metastatic potential regardless of the presence of any cellular atypia. Likewise, the tumor has a high metastatic potential and is considered an leiomyosarcoma, regardless of the degree of cellular atypia, if the mitotic count is greater than 10 per 10 HPF. Some believe that mitotic count alone is not a good indicator of metastatic potential. Endometrial Stromal Sarcomas (ESS) are a type of uterine cancer arising from the uterine mesenchymal tissue. ESS can be divided into 2 categories: low-grade ESS (LGESS) and high-grade or undifferentiated ESS (HGESS). LGESS is characterized by fewer than 5-10 mitoses per 10 HPF and minimal cellular atypia. These tumors can have a recurrence rate of up to 50% but demonstrate indolent growth and late recurrences. HGESS have a greater mitotic count and degree of cellular atypia with associated necrosis and invasion. Risk of recurrence in both LGESS and HGESS is determined not only by histological characteristics but also by surgical stage and extent of disease. Uterine adenosarcomas are comprised of mixed epithelial and mesenchymal tissues. They are rare and usually diagnosed with disease confined to the uterus. More than 90% of patients with endometrial cancer will present with abnormal vaginal bleeding, whether it is menorrhagia, metrorrhagia, or any amount of postmenopausal bleeding. Approximately 10% of postmenopausal bleeding will lead to a diagnosis of endometrial cancer. Advanced cases, especially patients with uterine papillary serous or clear cell histologies may present with abdominal pain and bloating or other symptoms of metastatic disease. Other presenting symptoms may include purulent genital discharge, pain, weight loss, and a change in bladder or bowel habits. Fortunately, most cases of endometrial cancer are diagnosed prior to this clinical presentation because of the recognition of postmenopausal bleeding as a possible early symptom of cancer. About 5% of women may be asymptomatic and diagnosed after workup of abnormal Papanicolaou test results. Uterine sarcomas can present in a similar fashion to endometrial carcinomas with vaginal bleeding, and often pelvic pressure. Imaging will reveal a uterine mass and enlargement. Leiomyosarcoma may present in women early in the sixth decade of life with irregular menses or postmenopausal bleeding. Other symptoms include pain, pelvic pressure, and a rapidly enlarging pelvic mass. Unfortunately, the diagnosis is rarely made prior to definitive surgery. Endometrial stromal sarcoma (ESS) usually presents with postmenopausal bleeding, pelvic pain, and an enlarging mass. Like mixed müllerian tumors (MMT), ESS typically presents in the seventh decade of life. Weight loss, anorexia, and change in bowel or bladder habits are signs of advanced disease in all cases of uterine cancer. The mainstay of primary treatment in endometrial cancer and uterine sarcomas is surgery. Radiation has an important role in adjuvant treatment of endometrial cancers and sarcomas. Chemotherapy plays a role in adjuvant therapy for high-grade uterine sarcomas, in addition to high grade, recurrent or metastatic endometrial cancer. Hormonal therapy also has a role in adjuvant therapy in receptor-positive uterine cancers. Details regarding all of these therapies are discussed later in this article. Like endometrial cancer, primary surgical therapy is the first step in treatment of uterine sarcomas. In fact, these tumors are often found at the time of surgery for benign indications such as uterine leiomyomata and dysfunctional uterine bleeding. Often they are found incidentally on post-operative pathological evaluation of myomectomy or hysterectomy specimen. See the images below for relevant surgical anatomy. 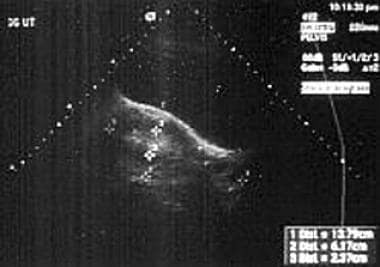 Transvaginal ultrasonography demonstrating an enlarged endometrial stripe (EMS = 2.4 cm). Siegel R, Miller K, Jemal A. Cancer statistics, 2015. CA Cancer J Clin. 2015. 65:5-29. Ueda SM, Kapp DS, Cheung MK, Shin JY, Osann K, Husain A, et al. Trends in demographic and clinical characteristics in women diagnosed with corpus cancer and their potential impact on the increasing number of deaths. Am J Obstet Gynecol. 2008 Feb. 198 (2):218.e1-6. [Medline]. del Carmen MG, Birrer M, Schorge JO. Uterine papillary serous cancer: a review of the literature. Gynecol Oncol. 2012 Dec. 127(3):651-61. [Medline]. Soliman PT, Oh JC, Schmeler KM, et al. Risk factors for young premenopausal women with endometrial cancer. Obstet Gynecol. 2005 Mar. 105(3):575-80. [Medline]. Walsh C, Holschneider C, Hoang Y, Tieu K, Karlan B, Cass I. Coexisting ovarian malignancy in young women with endometrial cancer. Obstet Gynecol. 2005 Oct. 106(4):693-9. [Medline]. Lu KH, Schorge JO, Rodabaugh KJ, et al. Prospective determination of prevalence of lynch syndrome in young women with endometrial cancer. J Clin Oncol. 2007 Nov 20. 25(33):5158-64. [Medline]. Lu KH, Dinh M, Kohlmann W, et al. Gynecologic cancer as a "sentinel cancer" for women with hereditary nonpolyposis colorectal cancer syndrome. Obstet Gynecol. 2005 Mar. 105(3):569-74. [Medline]. Raine-Bennett T, Tucker LY, Zaritsky E, Littell RD, Palen T, Neugebauer R, et al. Occult Uterine Sarcoma and Leiomyosarcoma: Incidence of and Survival Associated With Morcellation. Obstet Gynecol. 2016 Jan. 127 (1):29-39. [Medline]. Pritts EA, Vanness DJ, Berek JS, Parker W, Feinberg R, Feinberg J, et al. The prevalence of occult leiomyosarcoma at surgery for presumed uterine fibroids: a meta-analysis. Gynecol Surg. 2015. 12 (3):165-177. [Medline]. Renehan AG, Tyson M, Egger M, Heller RF, Zwahlen M. Body-mass index and incidence of cancer: a systematic review and meta-analysis of prospective observational studies. Lancet. 2008 Feb 16. 371(9612):569-78. [Medline]. The Cancer and Steroid Hormone Study of the Centers for disease Control and the National Institute of Child Health and Human Development. Combination oral contraceptive use and the risk of endometrial cancer. The Cancer and Steroid Hormone Study of the Centers for Disease Control and the National Institute of Child Health and Human Development. JAMA. 1987 Feb 13. 257(6):796-800. [Medline]. Doherty JA, Cushing-Haugen KL, Saltzman BS, et al. Long-term use of postmenopausal estrogen and progestin hormone therapies and the risk of endometrial cancer. Am J Obstet Gynecol. 2007 Aug. 197(2):139.e1-7. [Medline]. Gatius S, Velasco A, Azueta A, et al. FGFR2 alterations in endometrial carcinoma. Mod Pathol. 2011 Nov. 24(11):1500-10. [Medline]. Kasuya G, Toita T, Furutani K, Kodaira T, Ohno T, Kaneyasu Y, et al. Distribution patterns of metastatic pelvic lymph nodes assessed by CT/MRI in patients with uterine cervical cancer. Radiat Oncol. 2013 Jun 8. 8(1):139. [Medline]. Karlsson B, Granberg S, Wikland M, et al. Transvaginal ultrasonography of the endometrium in women with postmenopausal bleeding--a Nordic multicenter study. Am J Obstet Gynecol. 1995 May. 172(5):1488-94. [Medline]. Wang J, Wieslander C, Hansen G, Cass I, Vasilev S, Holschneider CH. Thin endometrial echo complex on ultrasound does not reliably exclude type 2 endometrial cancers. Gynecol Oncol. 2006 Apr. 101(1):120-5. [Medline]. ACOG Practice Bulletin #99. Management of abnormal cervical cytology and histology. ACOG Practice Bulletin #99. Management of abnormal cervical cytology and histology. December 2008. Creasman WT, Odicino F, Maisonnueve P. FIGO Annual Report on the Results of Treatment in Gynaecological Cancer: Carcinoma of the corpus uteri. J Epidemiol Biostat. 1998. 23(1):35-61. Morrow CP, Bundy BN, Kurman RJ, et al. Relationship between surgical-pathological risk factors and outcome in clinical stage I and II carcinoma of the endometrium: a Gynecologic Oncology Group study. Gynecol Oncol. 1991 Jan. 40(1):55-65. [Medline]. Sorbe B, Nordström B, Mäenpää J, Kuhelj J, Kuhelj D, Okkan S, et al. Intravaginal brachytherapy in FIGO stage I low-risk endometrial cancer: a controlled randomized study. Int J Gynecol Cancer. 2009 Jul. 19 (5):873-8. [Medline]. Creutzberg CL, van Putten WL, Koper PC, Lybeert ML, Jobsen JJ, Warlam-Rodenhuis CC, et al. Surgery and postoperative radiotherapy versus surgery alone for patients with stage-1 endometrial carcinoma: multicentre randomised trial. PORTEC Study Group. Post Operative Radiation Therapy in Endometrial Carcinoma. Lancet. 2000 Apr 22. 355(9213):1404-11. [Medline]. Scholten AN, van Putten WL, Beerman H, et al. Postoperative radiotherapy for Stage 1 endometrial carcinoma: long-term outcome of the randomized PORTEC trial with central pathology review. Int J Radiat Oncol Biol Phys. 2005 Nov 1. 63(3):834-8. [Medline]. Keys HM, Roberts JA, Brunetto VL, et al. A phase III trial of surgery with or without adjunctive external pelvic radiation therapy in intermediate risk endometrial adenocarcinoma: a Gynecologic Oncology Group study. Gynecol Oncol. 2004 Mar. 92(3):744-51. [Medline]. Blake P, Swart AM, Orton J, et al. Adjuvant external beam radiotherapy in the treatment of endometrial cancer (MRC ASTEC and NCIC CTG EN.5 randomised trials): pooled trial results, systematic review, and meta-analysis. Lancet. 2009 Jan 10. 373(9658):137-46. [Medline]. Nout RA, Smit VT, Putter H, Jürgenliemk-Schulz IM, Jobsen JJ, Lutgens LC, et al. Vaginal brachytherapy versus pelvic external beam radiotherapy for patients with endometrial cancer of high-intermediate risk (PORTEC-2): an open-label, non-inferiority, randomised trial. Lancet. 2010 Mar 6. 375 (9717):816-23. [Medline]. Nout RA, Putter H, Jürgenliemk-Schulz IM, Jobsen JJ, Lutgens LC, van der Steen-Banasik EM, et al. Five-year quality of life of endometrial cancer patients treated in the randomised Post Operative Radiation Therapy in Endometrial Cancer (PORTEC-2) trial and comparison with norm data. Eur J Cancer. 2012 Jul. 48 (11):1638-48. [Medline]. Randall ME, Filiaci VL, Muss H, et al. Randomized phase III trial of whole-abdominal irradiation versus doxorubicin and cisplatin chemotherapy in advanced endometrial carcinoma: a Gynecologic Oncology Group Study. J Clin Oncol. 2006 Jan 1. 24(1):36-44. [Medline]. Sovak MA, Hensley ML, Dupont J, et al. Paclitaxel and carboplatin in the adjuvant treatment of patients with high-risk stage III and IV endometrial cancer: a retrospective study. Gynecol Oncol. 2006 Nov. 103(2):451-7. [Medline]. Lupe K, Kwon J, D'Souza D, et al. Adjuvant paclitaxel and carboplatin chemotherapy with involved field radiation in advanced endometrial cancer: a sequential approach. Int J Radiat Oncol Biol Phys. 2007 Jan 1. 67(1):110-6. [Medline]. Miller D, Filiaci V, Fleming R, et al. Abstract: Randomized phase III noninferiority trial of first line chemotherapy for metastatic or recurrent endometrial carcinoma: a GOG Study. Gynecologic Oncology. June 2012. 125 (3):771. Grigsby PW, Kuske RR, Perez CA, Walz BJ, Camel MH, Kao MS, et al. Medically inoperable stage I adenocarcinoma of the endometrium treated with radiotherapy alone. Int J Radiat Oncol Biol Phys. 1987 Apr. 13(4):483-8. [Medline]. Case AS, Rocconi RP, Straughn JM Jr, et al. A prospective blinded evaluation of the accuracy of frozen section for the surgical management of endometrial cancer. Obstet Gynecol. 2006 Dec. 108(6):1375-9. [Medline]. Chan JK, Cheung MK, Huh WK, et al. Therapeutic role of lymph node resection in endometrioid corpus cancer: a study of 12,333 patients. Cancer. 2006 Oct 15. 107(8):1823-30. [Medline]. Palomba S, Falbo A, Mocciaro R, Russo T, Zullo F. Laparoscopic treatment for endometrial cancer: a meta-analysis of randomized controlled trials (RCTs). Gynecol Oncol. 2009 Feb. 112(2):415-21. [Medline]. Havrilesky LJ, Cragun JM, Calingaert B, et al. The prognostic significance of positive peritoneal cytology and adnexal/serosal metastasis in stage IIIA endometrial cancer. Gynecol Oncol. 2007 Feb. 104(2):401-5. [Medline]. Bristow RE, Zerbe MJ, Rosenshein NB, Grumbine FC, Montz FJ. Stage IVB endometrial carcinoma: the role of cytoreductive surgery and determinants of survival. Gynecol Oncol. 2000 Aug. 78(2):85-91. [Medline]. Ramirez PT, Frumovitz M, Bodurka DC, Sun CC, Levenback C. Hormonal therapy for the management of grade 1 endometrial adenocarcinoma: a literature review. Gynecol Oncol. 2004 Oct. 95(1):133-8. [Medline]. Ushijima K, Yahata H, Yoshikawa H, et al. Multicenter phase II study of fertility-sparing treatment with medroxyprogesterone acetate for endometrial carcinoma and atypical hyperplasia in young women. J Clin Oncol. 2007 Jul 1. 25(19):2798-803. [Medline]. Lee TS, Jung JY, Kim JW, et al. Feasibility of ovarian preservation in patients with early stage endometrial carcinoma. Gynecol Oncol. 2007 Jan. 104(1):52-7. [Medline]. Schwartz SM, Weiss NS, Daling JR, et al. Incidence of histologic types of uterine sarcoma in relation to menstrual and reproductive history. Int J Cancer. 1991 Sep 30. 49(3):362-7. [Medline]. Silverberg SG, Major FJ, Blessing JA, et al. Carcinosarcoma (malignant mixed mesodermal tumor) of the uterus. A Gynecologic Oncology Group pathologic study of 203 cases. Int J Gynecol Pathol. 1990. 9(1):1-19. [Medline]. Soper JT, Creasman WT, Clarke-Pearson DL, Sullivan DC, Vergadoro F, Johnston WW. Intraperitoneal chromic phosphate P 32 suspension therapy of malignant peritoneal cytology in endometrial carcinoma. Am J Obstet Gynecol. 1985 Sep 15. 153(2):191-6. [Medline]. Bloss JD, Berman ML, Bloss LP, Buller RE. Use of vaginal hysterectomy for the management of stage I endometrial cancer in the medically compromised patient. Gynecol Oncol. 1991 Jan. 40(1):74-7. [Medline]. Chi DS, Curtin JP. Gynecologic cancer and laparoscopy. Obstet Gynecol Clin North Am. 1999 Mar. 26(1):201-15. [Medline]. Christopherson WM, Alberhasky RC, Connelly PJ. Carcinoma of the endometrium. II. Papillary adenocarcinoma: a clinical pathological study, 46 cases. Am J Clin Pathol. 1982 May. 77(5):534-40. [Medline]. Creasman WT, Morrow CP, Bundy BN, Homesley HD, Graham JE, Heller PB. Surgical pathologic spread patterns of endometrial cancer. A Gynecologic Oncology Group Study. Cancer. 1987 Oct 15. 60(8 Suppl):2035-41. [Medline]. DiSaia PJ, Creasman WT, Boronow RC, Blessing JA. Risk factors and recurrent patterns in Stage I endometrial cancer. Am J Obstet Gynecol. 1985 Apr 15. 151(8):1009-15. [Medline]. Efange SM, Michelson RH, Knusel B, et al. Synthesis and biological evaluation of radioiodinated N-2-(4-piperidyl)ethyl benzamides. Nucl Med Biol. 1993 May. 20(4):527-38. [Medline]. Egarter C, Krestan C, Kurz C. Abdominal dissemination of malignant cells with hysteroscopy. Gynecol Oncol. 1996 Oct. 63(1):143-4. [Medline]. Fung-Kee-Fung M, Dodge J, Elit L, Lukka H, Chambers A, Oliver T. Follow-up after primary therapy for endometrial cancer: a systematic review. Gynecol Oncol. 2006 Jun. 101(3):520-9. [Medline]. Galaal K, Godfrey K, Naik R, Kucukmetin A, Bryant A. Adjuvant radiotherapy and/or chemotherapy after surgery for uterine carcinosarcoma. Cochrane Database of Systematic Reviews 2011. Issue 1:Art. No. : CD006812. DOI:10.1002/14651858.CD006812.pub2. Gemignani ML, Curtin JP, Zelmanovich J, Patel DA, Venkatraman E, Barakat RR. Laparoscopic-assisted vaginal hysterectomy for endometrial cancer: clinical outcomes and hospital charges. Gynecol Oncol. 1999 Apr. 73(1):5-11. [Medline]. Granberg S, Wikland M, Karlsson B, Norstrom A, Friberg LG. Endometrial thickness as measured by endovaginal ultrasonography for identifying endometrial abnormality. Am J Obstet Gynecol. 1991 Jan. 164(1 Pt 1):47-52. [Medline]. Harlow BL, Weiss NS, Lofton S. The epidemiology of sarcomas of the uterus. J Natl Cancer Inst. 1986 Mar. 76(3):399-402. [Medline]. Hawwa ZM, Nahhas WA, Copenhaver EH. Postmenopausal bleeding. Lahey Clin Found Bull. 1970 Apr-Jun. 19(2):61-70. [Medline]. Hensley ML, Maki R, Venkatraman E, et al. Gemcitabine and docetaxel in patients with unresectable leiomyosarcoma: results of a phase II trial. J Clin Oncol. 2002 Jun 15. 20(12):2824-31. [Medline]. International Federation of Gynecology and Obstetrics. Annual report on the results of treatment in gynecologic cancer. Int J Gynecol Obstet. 1989. 28:189. Jemal A, Murray T, Ward E, et al. Cancer statistics, 2005. CA Cancer J Clin. 2005 Jan-Feb. 55(1):10-30. [Medline]. Kauppila A. Progestin therapy of endometrial, breast and ovarian carcinoma. A review of clinical observations. Acta Obstet Gynecol Scand. 1984. 63(5):441-50. [Medline]. Kempson RL, Bari W. Uterine sarcomas. Classification, diagnosis, and prognosis. Hum Pathol. 1970 Sep. 1(3):331-49. [Medline]. Kurman RJ, Kaminski PF, Norris HJ. The behavior of endometrial hyperplasia. A long-term study of "untreated" hyperplasia in 170 patients. Cancer. 1985 Jul 15. 56(2):403-12. [Medline]. Lehoczky O, Bosze P, Ungar L, Tottossy B. Stage I endometrial carcinoma: treatment of nonoperable patients with intracavitary radiation therapy alone. Gynecol Oncol. 1991 Dec. 43(3):211-6. [Medline]. Leibsohn S, d'Ablaing G, Mishell DR Jr, Schlaerth JB. Leiomyosarcoma in a series of hysterectomies performed for presumed uterine leiomyomas. Am J Obstet Gynecol. 1990 Apr. 162(4):968-74; discussion 974-6. [Medline]. Liu JH. American College of Obstetricians and Gynecologists: Hormone Replacement Therapy. Educational Bulletin # 247. Loeffler JS, Rosen EM, Niloff JM, Howes AE, Knapp RC. Whole abdominal irradiation for tumors of the uterine corpus. Cancer. 1988 Apr 1. 61(7):1332-5. [Medline]. Mackillop WJ, Pringle JF. Stage III endometrial carcinoma. A review of 90 cases. Cancer. 1985 Nov 15. 56(10):2519-23. [Medline]. Major FJ, Blessing JA, Silverberg SG, et al. Prognostic factors in early-stage uterine sarcoma. A Gynecologic Oncology Group study. Cancer. 1993 Feb 15. 71(4 Suppl):1702-9. [Medline]. Mariani A, Webb MJ, Keeney GL, Aletti G, Podratz KC. Assessment of prognostic factors in stage IIIA endometrial cancer. Gynecol Oncol. 2002 Jul. 86(1):38-44. [Medline]. Massi G, Savino L, Susini T. Vaginal hysterectomy versus abdominal hysterectomy for the treatment of stage I endometrial adenocarcinoma. Am J Obstet Gynecol. 1996 Apr. 174(4):1320-6. [Medline]. Milosevic MF, Dembo AJ, Thomas GM. The clinical significance of malignant peritoneal cytology in stage I endometrial carcinoma. Int J Gynecol Cancer. 1992 Sep. 2(5):225-235. [Medline]. Moore DH, Fowler WC Jr, Walton LA, Droegemueller W. Morbidity of lymph node sampling in cancers of the uterine corpus and cervix. Obstet Gynecol. 1989 Aug. 74(2):180-4. [Medline]. Moore TD, Phillips PH, Nerenstone SR, Cheson BD. Systemic treatment of advanced and recurrent endometrial carcinoma: current status and future directions. J Clin Oncol. 1991 Jun. 9(6):1071-88. [Medline]. Omura GA, Blessing JA, Major F, et al. A randomized clinical trial of adjuvant adriamycin in uterine sarcomas: a Gynecologic Oncology Group Study. J Clin Oncol. 1985 Sep. 3(9):1240-5. [Medline]. Orr JW Jr, Holloway RW, Orr PF, Holimon JL. Surgical staging of uterine cancer: an analysis of perioperative morbidity. Gynecol Oncol. 1991 Sep. 42(3):209-16. [Medline]. Pacaut C, Bourmaud A, Rivoirard R, Moriceau G, Guy JB, Collard O, et al. Uterine and Ovary Carcinosarcomas: Outcome, Prognosis Factors, and Adjuvant Therapy. Am J Clin Oncol. 2013 Jun 6. [Medline]. Parazzini F, La Vecchia C, Bocciolone L, Franceschi S. The epidemiology of endometrial cancer. Gynecol Oncol. 1991 Apr. 41(1):1-16. [Medline]. Peters WA 3rd, Andersen WA, Thornton WN Jr, Morley GW. The selective use of vaginal hysterectomy in the management of adenocarcinoma of the endometrium. Am J Obstet Gynecol. 1983 Jun 1. 146(3):285-9. [Medline]. Quinn MA, Campbell JJ. Tamoxifen therapy in advanced/recurrent endometrial carcinoma. Gynecol Oncol. 1989 Jan. 32(1):1-3. [Medline]. Reddoch JM, Burke TW, Morris M, Tornos C, Levenback C, Gershenson DM. Surveillance for recurrent endometrial carcinoma: development of a follow-up scheme. Gynecol Oncol. 1995 Nov. 59(2):221-5. [Medline]. Runowicz CD, Nuchtern LM, Braunstein JD, Jones JG. Heterogeneity in hormone receptor status in primary and metastatic endometrial cancer. Gynecol Oncol. 1990 Sep. 38(3):437-41. [Medline]. Picerno TM, Wasson MN, Gonzalez Rios AR, et al. Morcellation and the incidence of occult uterine malignancy: a dual-institution review. Int J Gynecol Cancer. 2016 Jan. 26(1):149-55. [Medline]. Exner M, Kuhn A, Stumpp P, et al. Value of diffusion-weighted MRI in diagnosis of uterine cervical cancer: a prospective study evaluating the benefits of DWI compared to conventional MR sequences in a 3T environment. Acta Radiol. 2015 Sep 1. [Medline]. The authors and editors of Medscape Reference gratefully acknowledge the contributions of previous authors William E Winter III, MD, and Jim A Gosewehr, MD, to the development and writing of this article.